The function of the visual merchandiser is to create an inviting and visually appealing environment for the customer's shopping experience. This role is actually more part of the sales team than the marketing team. The efforts of the visual merchandiser can create displays that act as silent salespeople. And their attention to revenue enhancing details like quality signage are more valued than their creative or designer eye. After all, its good to have a display that looks beautiful, but its great to have one that sells merchandise. The visual merchandising of the store sets the tone or mood for a shopper. A crisp, well-merchandised store with inviting displays promotes an engaging atmosphere. A sloppy or disorganized store promotes a chaotic atmosphere. The first one creates buyers - the second creates shoppers. But remember this, the measure of a great visual merchandiser is not in the aesthetic of the store, but in the merchandising's ability to create sales. So, keep in mind that while "eye" or "taste" or "fashion sense" are great attributes of a retail visual merchandiser and often what draws a person to want to do this role, a connection with the outcome is vitally important. When I was on the board at the University of North Texas School of Merchandising, we found that the degree plans were woefully lacking math requirements. Buyers and merchandisers were all focused on the look and not on the results. Employers are focused on the results. Visual merchandisers will have knowledge of colors, patterns, and floor-sets. Their job is to communicate with store managers to work out the floor layout and display points, as well as how and what items are to be displayed. Window designs, internal displays and other merchandising of promotional events to entice the customer to buy may be required. Visual merchandisers will be responsible for using appropriate lighting for the best presentation possible, arranging signage and coordinating the take down of displays after promotion. The role also needs to have some analytical skills as well. For example, does the display increase sales or does it enhance the brand. Stores need both types, but often times, visual merchandisers get tunnel vision and only focus on the creative side. The higher paid and more valuable visual merchandisers are able to convey the strategy behind the design - in other words - how it makes the store money. Absent the ability to prove the ROI (return on investment) the visual merchandiser is a role in the retail store that can easily be cut when sales are down or the economy is slow. Give management and ownership a reason to keep you on the team. Previous retail experience and good physical condition is a must. 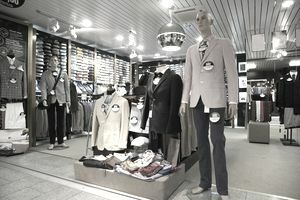 Visual merchandisers will be highly creative, enthusiastic and have a natural finesse for color, balance and composition. A strong understanding of current market trends and innovative visual approaches are extremely helpful. The ability to adapt trends from other markets, business and business types into the merchandising of the store. Must be able to deliver design and planning that is consistent with the brand image and message. As with most retail positions, a high school diploma or GED is the only education requirement. College degree in business, or a closely related field, may substitute for a portion of the required experience. There are many universities that now offer a degree in visual presentation. These degrees will command a higher compensation package. So, while you can get to this role with the right "talent" the degree (proof and validation of talent) actually makes a big difference in this role. There are many examples of people working the same roles, but being compensated differently based on degrees. The equalizer is awards; if your work has won recognition or awards, then you can overcome the lack ofa degree. Salary will vary with store sales and location. Compensation ranges from around $34,000 to $54,000. The salary range is based on years of experience, size of retailer and type of retailer. For example, a visual merchandiser at a fashion retailer is a more valuable asset than at a hardware store.